The Amateur argues that professionals -- and the roles they assume -- facilitate the wealth generation of those in power in our neoliberal hierarchy. Most professionalism is simply playacting. 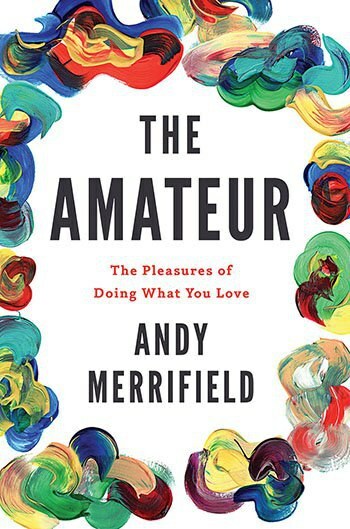 Andy Merrifield’s provocative treatise The Amateur: The Pleasures of Doing What You Love presents itself as a celebration of amateurism in all fields: from politics to intellectualism to the arts and beyond. In fact, the book tackles much more serious and important terrain than simply offering chicken soup for the hobbyist’s soul. Merrifield’s mission is not so much to extol the virtues of amateurs as to decry the role of professionals in modern society. He argues that most ‘professionalism’ is simply play-acting. Those who go through the motions of a role, performing all the right actions (obtaining graduate degrees, working their way through public service, advancing through the corporate world) are eventually granted a certain privileged status, reflected both in wealth and financial security, but more importantly in an assumption of wisdom and leadership. It’s our society’s critical flaw, warns Merrifield -- the only thing those people have really demonstrated is their ability to conform, unthinkingly, to the expectations of others (who in their turn conformed). Consequently we are left with a class of professionals -- corporate, academic, political, bureaucratic -- who may have little to no actual talent beyond the ability to mimic the forms demanded by their roles, and on the basis of which they have been invested with tremendous public authority and trust. The result is a class of leadership -- political, civil, academic, corporate, military -- whose key quality is the ability to say what their superiors want to hear. For society, it’s a recipe for disaster. Worst of all, it appears that some of the professional think they have ability and talent to be in their station; they’ve come to believe in the myth of their own success. They have to: in order to subjugate their own innate curiosity and imagination they’ve had to conform to the soul-killing dictates of professionalism: go through the mindless routines of obtaining their PhDs, inch forward through the bureaucracy, promote ones' self through the auspicies of the corporation. We try to put a positive spin on the routines -- calling this perseverance, discipline, what have you -- but really it’s a bunch of pointless vacuity. As they obediently do what they’re told is expected of them, the only way these nascent professionals can suffer through such soul-killing mediocrity is to convince themselves that their efforts have some meaning or value. Otherwise they would realize just how thoroughly they’re wasting their own lives and potential talent. Society has always been saddled with the burden of form-fitting professionals, to greater or lesser degrees. The growing contemporary problem, however, is that our present society takes professionalism far too seriously, and increasingly denies legitimacy to those who don’t conform to those professional expectations. It’s more likely to value the opinion of a political scientist than an average member of the voting public; more likely to value a securely tenured academic who studies precarious work over someone who experiences precarious work themselves. There has been a closure of the public space to those who don’t have the professional credentials to play the role that is expected of them, and this is critically starving our society of innovation, insight, ability and creativity. It’s also starving us of genuine democratic dialogue. Complicit in this closure of public space are a number of gatekeepers -- often themselves also ‘professionals’ in media, academics, politics with a vested interest in maintaining the myth of their own legitimacy, and of the broad ‘professional’ class. And it’s getting worse. Instead of consulting the public on matters of public affairs, supposedly democratic governments hire consultants like Ernst & Young to conduct studies and make policy proposals instead. Instead of crafting fiscal policies around the demands of the electorate, governments craft policies based on what credit-rating agencies like Moodys or S&P (Standard & Poors) tell them to do. Instead of facilitating public dialogues between members of the public, media and journalists host talk-shows pitching ‘professionals’ in staged verbal jousting matches with each other. Everyone is simply play-acting their professional roles; nobody is substantively acting with curiosity, creativity, imagination. Our society -- and the individuals of which it is comprised -- are withering as a result. What can we do about it? That’s the problem, and Merrifield doesn’t have a clear answer. He suggests we could do with ‘jesters’ and ‘wild cards’ to shake up the established system. Yes, but that merely shakes it up, it doesn’t change or transform anything. When it comes time do get down to business, the court jester can always be shooed out of the room after providing a bit of entertainment. Merrifield points to the growing movement around anti-work politics, and this is a more promising approach. Anti-work politics is all about overturning the archaic sense of virtue in employment, and pushing for Guaranteed Annual Incomes and other ways of reducing work while boosting freely accessible social welfare. This holds promise, especially insofar as it could help to reduce the gap between 'professionals' (as a product of privilege) and everyone else. Anti-work politics isn’t about laziness (associating work with virtue is one of those archaic value-sets that enabled wealthy elites to profit off the exploitation of the masses) but about ensuring all of society is able to benefit from the advances of modern technology, not just the lazy rich and elites. He provides the example of the ‘Happy Unemployed’ (Chomeurs Heureux) movement in France and Germany. He looks (briefly) at other nascent movements of popular empowerment, past and present -- from anarchists in Sweden to activists in Greece -- and mines philosophical notions like Henri Lefebvre’s ‘right to the city’ (an expression of participatory democracy) or the notion of ‘shadow citizenry’ (the shared identity of the disenfranchised the world over, waiting for its turn to emerge triumphant over the crumbling tyranny of borders and passports). But these are merely morale-boosting suggestions; he doesn’t so much offer solutions as explain why it is so foolish for us to go on entrusting our societies and our futures to a ‘professional’ class which is more about self-promotion than societal improvement. It’s a vital and important critique, and even without providing solutions still serves a critically important role by throwing out the question and exploring it in a series of thoughtful reflections. Of course, in doing so he draws on the ideas of a number of great thinkers -- ironically, they are mostly professionals themselves, or today deemed to have been such. Figures like Pierre Bourdieu, Walter Benjamin, Karl Marx, Hannah Arendt, Rachel Carson, Jane Jacobs, and so on may have aligned themselves at various points in their lives with a critique of the professional class, but they could hardly be considered ‘amateurs’. Perhaps the clearer route toward overthrowing the stultifying and socially regressive tyranny of the professional class is to reject ‘professionalism’ and ‘amateurism’ alike; to promote a fundamentally different way of thinking about how we think and act. Perhaps this is what Merrifield is driving toward. What that would look like is anyone’s guess. And the keyword is ‘anyone’. Other terms have emerged in recent years that capture equal parts of what Merrifield is driving toward. ‘Generalist’; ‘freelancer’; ‘jack-of-all-trades’; ‘renaissance person’. These terms aim to valorize a particular type of identity, but they’re also an implicit critique of the identity against which they must be contrasted: that of the professional. Merrifield’s book doesn’t necessarily convince that we need a society of amateurs, but it does provide a much needed take-down of the social legitimacy and sense of virtue with which the professional class has been endowed. It’s an critique of professionalism -- and an urgently needed one. It’s also a critique on the sociology and political economy of neoliberalism, which Merrifield accurately implies is upheld and reinforced by the legitimization of professionalism. The thing about professionals is that their status (and the way to achieve that status) is defined by whoever is in power; and that means contemporary professionalis -- and the roles professionals must assume -- is defined in such a way as to facilitate the wealth generation of those in power in the neoliberal hierarchy. Professionalism offers a route to advancement for a few -- in politics, academics, business, media and journalism, the arts -- provided they perform the expected roles of reinforcing the broader system of neoliberal capitalist exploitation that defines what a professional is in any given field. So long as you do what you’re told and don’t bite the hand that feeds you too hard (a few playful nips are always acceptable), you will be tolerated in your chosen professional status. Merrifield ends on a discussion of the merits of ‘professional revolutionaries’ versus ‘amateurs’, but makes a more important point before he reaches such insurrectionary concluding thoughts. Before we can challenge professionals, we have to challenge ourselves. Those of us who pursue professionalism in any field of endeavor have come to accept the hegemony of professionalism and its demands as a way of coming to live with ourselves and the soul-and-imagination-killing mediocrity of this approach to life. It’s a subjective attitude that we need to recognize and confront within ourselves, just as much as we need to confront it in wider society.